European and Asian stocks rose with U.S. equity index futures as a rebound in oil bolstered risk appetite ahead of heavily-anticipated central bank policy meetings this week. The dollar retreated versus all of its major peers, while yuan borrowing costs surged in Hong Kong. The Stoxx Europe 600 Index and an MSCI index of Asian stocks rallied following their biggest weekly slides in three months. The Australian dollar and Mexico’s peso led gains among the currencies of oil-exporting nations. 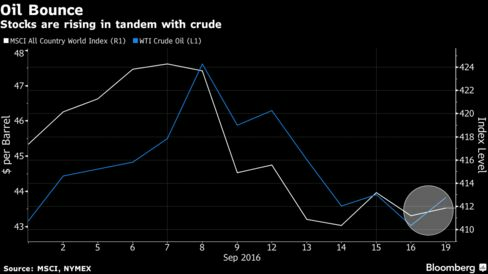 Crude rebounded from a one-month low as fighting disrupted supplies from Libya amid prospects major producers will act to stabilize prices. Overnight yuan borrowing costs in Hong Kong soared the most since January amid speculation China’s central bank was intervening to fend off bearish currency bets. Volatility has picked up in financial markets over the past two weeks amid concern central banks in Europe and Japan are becoming reluctant to loosen monetary policy further at a time when the Federal Reserve is deciding on the timing of the next U.S. interest-rate increase. Economists are split over what, if any, action the Bank of Japan will undertake in a review on Wednesday. While the chance of a Fed hike the same day remains around 20 percent, a steeper-than-projected increase in U.S. consumer prices boosted the dollar on Friday and spurred bets that borrowing costs will be raised in December. The Stoxx Europe 600 Index rose 0.7 percent as of 8:10 a.m. London time, after dropping 2.2 percent last week. Futures on the S&P 500 Index gained 0.3 percent. The MSCI Asia Pacific excluding Japan Index climbed 1 percent, after sinking 2.4 percent last week. Japan’s markets were closed Monday for a holiday. South Korea returned after a three-day break, while markets in mainland China and Taiwan were shut on Thursday and Friday. Hong Kong and Malaysia were closed on Friday. Taiwan’s Taiex index surged 2.8 percent from Wednesday’s close, the biggest jump in a year, as suppliers of Apple Inc. rallied amid booming demand for iPhone 7 handsets. A gauge of Chinese companies’ shares listed in Hong Kong was headed for the steepest gain in more than a month following a pickup in mainland demand for shares in the city. Australian equities were little changed after a technical glitch led to a delayed start and early close for the local bourse. Australia’s dollar strengthened 0.6 percent versus the greenback, buoyed by the pickup in oil prices and the A$9.7 billion ($7.3 billion) sale of a 50-year lease in Australia’s busiest port to a group of global investors. Among the currencies of other crude-exporting nations, the Mexican peso and the Canadian dollar rose 0.4 percent, while the Norwegian krone was up 0.3 percent. The Bloomberg Dollar Spot Index fell 0.3 percent following a 0.7 percent advance on Friday, when data showed the U.S. consumer-price index climbed 0.2 percent after being little changed in July. Economists predicted a 0.1 percent increase, a Bloomberg survey showed. The Japanese yen gained 0.2 percent and the British pound rose 0.4 percent. The yuan weakened 0.2 percent in offshore trading to 6.6692 per dollar even as the cost of borrowing the currency surged, making it costlier to bet on depreciation. The yuan’s overnight interbank rate in Hong Kong jumped 15.7 percentage points to 23.7 percent, its second-biggest gain on record. One- and three-month funding costs also increased, though by smaller increments. Taiwan’s dollar rose 0.8 percent from where it finished on Wednesday, leading gains among major currencies. Crude oil added 1.7 percent to $43.74 a barrel in New York, following a 6.2 percent slide last week. Clashes at Libya’s Ras Lanuf port are supporting prices, after they halted what would have been the first overseas crude shipment from that site since 2014. The head of OPEC said the group may call an extraordinary meeting if major producers reach consensus on an accord to stabilize oil prices at informal talks next week in Algiers. Copper dropped from a four-week high in London as Anglo American Plc restarted operations after a strike at its Los Bronces mine in central Chile, bolstering supply from the world’s largest producer. Nickel gained 2.2 percent, after a 6.2 percent weekly slide that marked its biggest loss since November. The yield on U.S. Treasuries due in a decade was little changed at 1.69 percent. It erased a three basis point decline on Friday following the release of the American inflation data, which boosted the probability of an interest-rate hike this year by five percentage points in the futures market to 55 percent. Portugal’s 10-year bond yield was steady at 3.42 percent, after surging 26 basis points last week. The nation’s debt rating was affirmed on Friday by S&P, which forecast the economy will lose momentum this year. The yield on similar-maturity notes in Germany held near zero on Monday.